From "The One Minute Manager" to "Raving Fans," Ken Blanchard's books have helped millions of people unleash their power and the potential of everyone around them. The Ken Blanchard Companies has helped thousands of organizations become more people-oriented, customer-centered, and performance-driven. 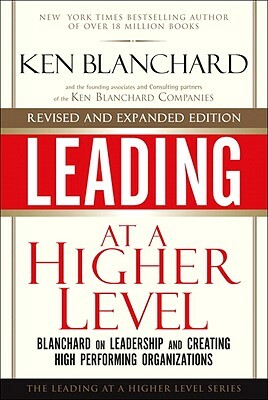 Now, in "Leading at a Higher Level," "Updated Edition," Blanchard and his colleagues bring together everything they've learned about world-class leadership. You'll discover how to create targets and visions based on the "triple bottom line," and make sure people know who you are, where you're going, and the values that will guide your journey. From start to finish, this book extends Blanchard's breakthrough work on delivering legendary customer service, creating "raving fans," and building "Partnerships for Performance" that empower everyone who works for and with you. Updated throughout, this new edition contains two powerful, important new chapters: one on coaching to create higher-level leaders, and another on creating a higher-level culture throughout your organization. It also offers the definitive, most up-to-date techniques for leading yourself, individuals, teams, and entire organizations. Most importantly, it will help you dig deep within, discover the personal "leadership point of view" all great leaders possess-and apply it throughout your entire life.